The Pearl of the Pacific”, as Captain Cook baptised her bears the magic of the most beautiful Polynesian islands. This ancient stretched volcano shows its two peaks, Mounts Pahia and Otemanu, whose green colors stand out against the jade, turquoise and sapphire shades of the lagoon. Known to be the most beautiful in the world, the lagoon, linked to the ocean by the Teavanui pass, is a natural swimming pool which offers a large variety of aquatic activities such as diving, sailing, jet skiing, snorkelling or even cruising on glass bottomed canoes. The lagoon in all its splendor: a volcano located in one of the most beautiful lagoons in the world surrounded by translucent water and fringed with idyllic motus. 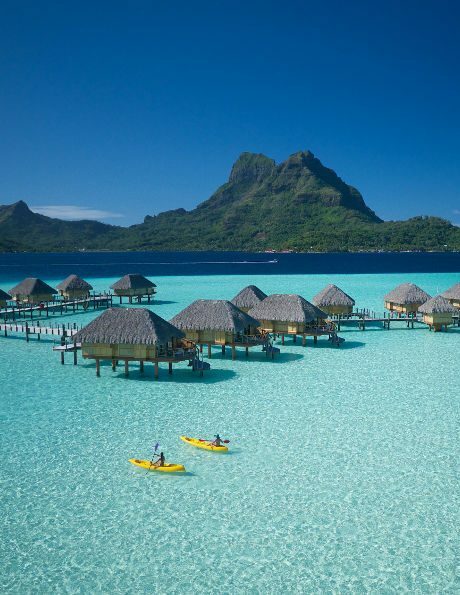 Perfect for island romance and a special destination for honeymoon couples, Bora Bora enjoys a varied hotel infrastructure from grand luxury to the small family boarding houses all perfectly merging with the magic of the exceptional natural beauty of the island. The unique over-water bungalow experience should not be missed: designed in pure Polynesian style, it offers an outstanding level of comfort in a most picturesque setting. Look through the turquoise waters of the lagoon to the bottom through a glass floor in your room. Wake up to the special treat of enjoying breakfast delivered to you by canoe. 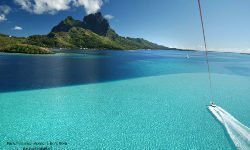 The underwater world of Bora Bora will satisfy even the most demanding diver: the manta ray’s ballet; majestic sharks; encounters with the gentle napoleons; and the multitude of multicolored fish. Beginner and advanced divers alike will don flippers and mask to join them in their amazing underwater world. A broad range of land and water sports activities offered by the island’s hotels or private providers: helicopter tours; hiking or outings in 4x4 to the interior of the island; horseback riding; parasailing; lagoon rides in glass-bottomed boats or outboard canoes; sailing on standard or luxury yachts; deep-sea fishing; picnics on a motu; feeding the rays and sharks. These are only some of the activities to be enjoyed. Truly, the most romantic island in the world. - Breakfast brought to your overwater bungalow's private balcony by an outrigger canoe regaled in flowers. 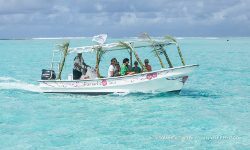 - Gourmet picnic lunches and diners enjoyed from a private beach on a motu. - Sharing a lagoon-view table at one of the many fine restaurants. - Polynesian wedding ceremonies from simple to royal. Ceremonies can be at the resorts, onboard a catamaran at sunset, or on a private beach at sunset complete with musicians and dancers. Each evening fish display at Bloody Marys(except Sundays), the daily catch of the local fishermen from Bora Bora is displayed on ice, where after an explanation of exactly what's available on your particular evening, the host takes your order directly with the chef. You can choose from the vast selection, pick one of their combination plates, or create your own particular combination. Crab, shrimp,steak, chicken, and a vegetarian plate are also available. It's truly a fine dining experience. The resort and island restaurants on Bora Bora are as famous as the island itself. span style="font-size: large;">Each of the resort and hotel restaurants offers world-class dining with magnificent lagoon views, while regular after-dinner Polynesian shows feature the island's best musicians and dancers. The famous Villa Mahana specializes in Mediterranean food in a romantic atmosphere (free pickup) or the Bloody Mary's with its sand floor, delicious sea food and polynesian atmosphere. 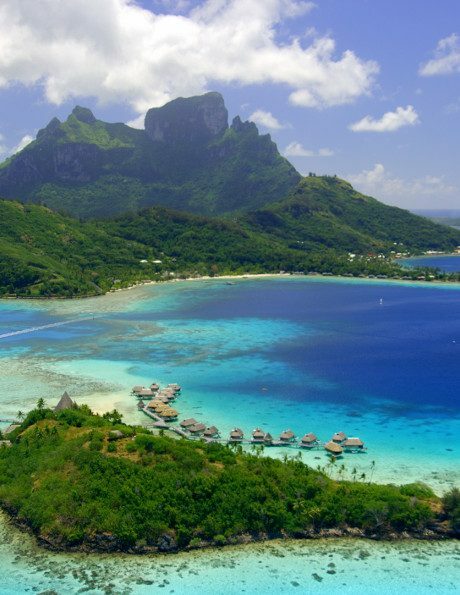 Bora Bora is within the same island chain as Tahiti and Moorea and is easily reached with regular flights. 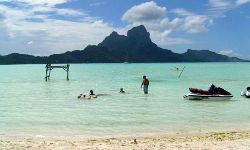 Bora Bora is served by Air Tahiti with frequent 45-minute flights from Papeete and Moorea, and 20-minute flights from Huahine and Raiatea. 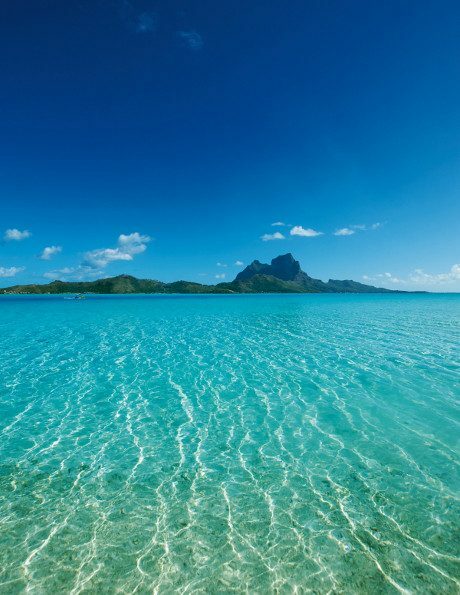 Air Tahiti also has regular flights to the Tuamotu Atolls and a weekly flight to the Marquesas. The airport, built on a beautiful motu, is accessible only by a short ferry ride to the port village of Vaitape. Resort transport is either by private motorboats from the airport operated by some of the luxury resorts or by shuttle from Vaitape. Also, helicopter transfer is available from Bora Bora airport for reserved guests of Le Taha'a Island Resort and Spa. Transport to your resort from the airport will be arranged by your travel consultant at easyTahiti.com based on your flights schedule. Bora Bora has few taxis and operates the public transit systems, Le Truck. In the evenings, restaurants provide transportation to and from your resort. The roads can be explored through hired excursion or rental car while the lagoon can be navigated by motorboat and outrigger canoe. Helicopters can also be hired for island tours.